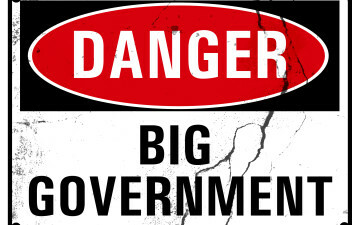 Giving the government control because of fear of an “oligarchy of the few is a sure recipe for tyranny. No private business can force people to buy their product, but government has the power of legal force. The “oligarchy of the few” derives its power from working through government to get special tax breaks, subsidies, and privileges, so with less government control there is less room for corruption. Why did the government go after Microsoft a few years ago? Their competitors had lobbyists; Microsoft didn’t. So the competitors used the government to make up for their lack of competitiveness in the free market. Most of the federal tax code is special favors for industries and companies that are willing to pay for influence. Most of what the Federal government now controls is not within the Constitutional limits of its authority. All this drains money from the private sector that could be put to productive use. This would benefit everyone—not just the bureaucrats and politicians. Do we really need to be told what kind of light bulbs we can buy or how much water our toilets may use per flush? Government regulations stifle innovation and new business development, and we wonder why the economy doesn’t do better. Businesses spend billions every year just trying to comply with government requirements. If you look at history, the recessions that were the shortest, and the recoveries the strongest, were the ones where government did the least. Many historians suggest that the New Deal made the Great Depression longer and that it took the Second World War to get the economy going again. Over the years we have allowed government to do more and more “FOR” us until we have become virtual slaves to a bureaucracy that now can do almost anything it wants “TO” us. It is now time to DRAIN THE SWAMP! Leftists Despicably Use Las Vegas Massacre For AgendaDisrespect for Authority, Hatred for America: How Did We Get to Such a Dark Place?